Eman, who is from Kuwait, is a recipient of the Global Women’s Leadership Scholarship at Cass Business School — part of a programme that develops thriving women leaders and supports them throughout their entire careers as they (sometimes) overcome adversity. The scholarship went towards her MSc Actuarial Science tuition fees and allowed her to focus on professional and personal growth, rather than the accumulation of debt. But the award is worth much more than the money. The scholarship will give her support and exposure to a network of inspirational women as she studies the MSc, giving her the chance to learn from their expertise. As part of the women’s leadership programme, events are held throughout the year — last month, for example, Cass hosted Inga Beale, former CEO of Lloyd’s of London. “The programme is incredibly important; it acts like a support system for women who want to do better in their field,” says Eman. “And it teaches you skills — at the events I’m sure we will learn more than a few things on how to engage in a work environment. “A lot of people talk about why it is important to have women for the sake of diversity. But we need women in leadership roles for other reasons. Eman came to Cass this year after studying financial mathematics at undergraduate level with the aim of improving her skillset to advance in the actuarial field. She is only a couple of months into the course, but already feels better prepared to achieve her ambitious, long-term career goals. 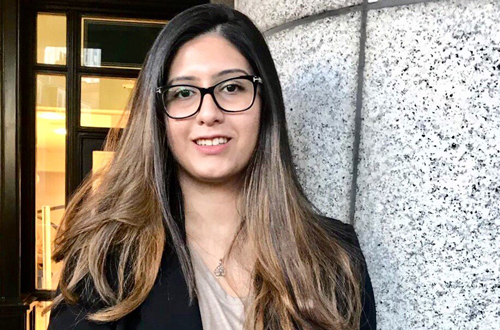 After completing the MSc, Eman hopes to attain an Actuarial Fellowship while gaining experience and enhancing her skill-set by working for a multinational firm as an actuarial or investment consultant. Longer-term, she plans to establish her own consultancy firm in Kuwait, offering risk management, data science and actuarial analysis services to clients in the Middle East and South Asian markets. “I think there’s a niche that I can fill,” she says. Even longer term, Eman wants to empower young women to become independent, fearless and ambitious — just like she was empowered by Pakistani women leaders like Malala Yousafzai and Asma Jahangir, who fought for equal rights, while growing up. “I aim to give women financial and moral support for education so that they are able to overcome adversity and gain financial independence,” says Eman. “I hope to one day provide a space where underprivileged women of all ages and backgrounds can complete their high school education for free. Read more about our Global Women's Leadership Programme.